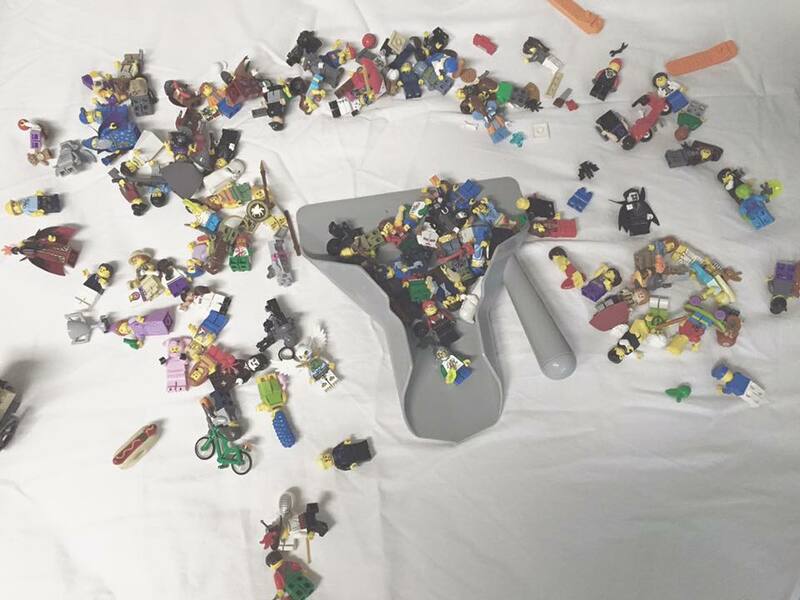 Use a fry bagger to sort LEGO parts? 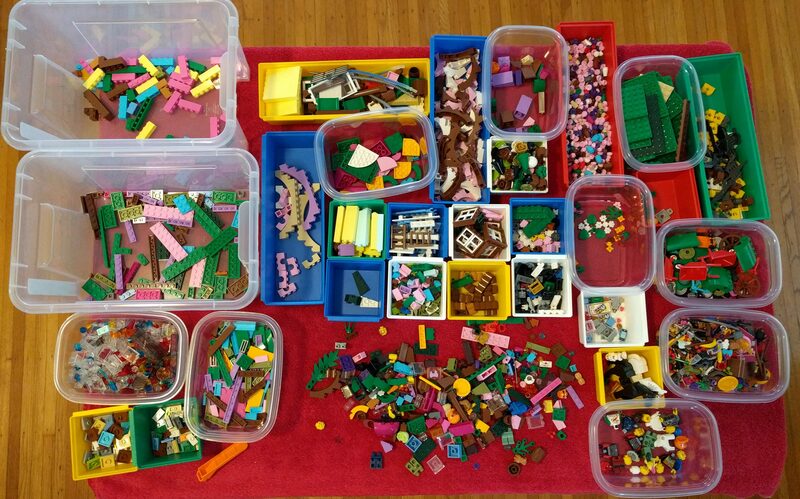 Use a fry bagger to put LEGO parts into Ziploc bags! What a great idea! I saw this today on Facebook, posted by Soyary Sunthorn‎ in the AFOLs of FaceBook group. He got a fry bagger – a tool used in fast food restaurants to put french fries into the bags or other containers they are served in. Full disclaimer: Amazon affiliate link above. I’ve been recently going through my LEGO collection adjusting some of the organization with respect to color. With all the new colors from the Friends sets coming in, I’ve been really at a loss to find an organization system that is consistent and clear, both while sorting and while looking for parts, and takes into account the vast differences in available parts across the color pallette. 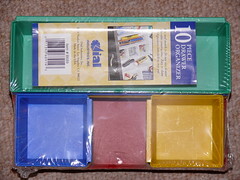 Bricks, plates (1x and 2x only), and tiles (except round ones): each color has its own container, and within that container each size is in a ziploc bag. Slopes: sorted into containers by angle (45, 33, etc.) and then ziploc bags within that container for each color. Corner and peak slopes are separated out from ordinary slopes as well. Everything else: all colors mixed together, sorted by shapes or categories of parts. So my thinking has evolved toward the conclusion that it’s better to have these rare colors separated out from the general population of my collection. If I’m going to build something out of purple parts, my options are more constrained by “what did LEGO make in this color?” than “can I find a specific part in this color?” anyway. But then the question became, which colors get this treatment? Obviously colors I don’t have much of, such as Maersk blue or the new colors only found in Friends sets, do. But what about Orange? Lime? Sand green? Dark blue? Dark tan? These colors are a lot more common in recent sets, and LEGO have made a pretty complete pallette of them (at least compared to colors like purple), but still I don’t have that many and in some cases they are easily confused for colors such as grey or black. I bet you can see where I’m going with this – I came to the realization that there are three types of color of LEGO parts. Rare colors: purple, sand red, sand blue, sand green, Maersk blue, dark brown, dark tan, dark flesh/nougat, bright green, pastels, azure, teal, etc. Main colors continue to be sorted as described above. I’ve been going through all my bins to pull out any Intermediate or Rare colors, however. The Intermediate colors get placed back in the bins where they were found, but in a separate ziploc bag. So I’m putting all those colors together in one bag in some cases, or where there is a lot of them into separate bags. 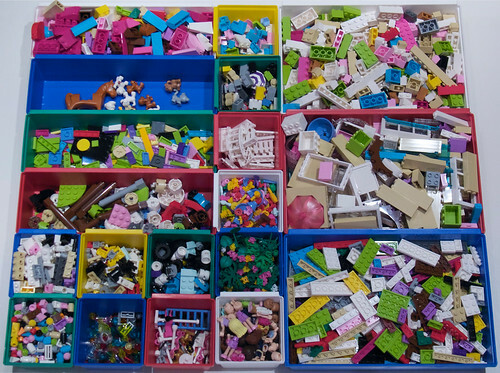 For bricks and plates and tiles, they still get their own color bins, stored alongside the main color bins. Dark red has reached sufficient ubiquity to be counted as a Main Color, and some of the other dark or sand colors come close but didn’t quite make the cut. But all the Rare color parts, regardless of what type or shape of part it is, get pulled out of the general population. These will be collected by color, and placed into a Rare Colors bin. All parts of the same color will go into one bag in most cases, except so far only Purple has enough parts to justify its own bin (because I bought a dozen #7591 Construct a Zurg sets on sale, so I have a lot of large purple parts). In most cases the parts are further divided into ziploc bags by type, and then those bags are placed together into a gallon ziploc bag. I recently bought some plastic bins at the local pharmacy (Longs Drugs, if you’re curious) and found them to be very useful for sorting LEGO parts. These are sold for organizing small things in a drawer. My mom used to have something kind of like it to sort her silverware when I was a kid (though not the little ones). I’ve put them to use sorting LEGO. I connect them together in a big array on a small table, and then designate each one for a particular type of LEGO part. 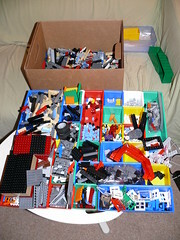 It’s usually not possible to have enough bins for every possible category of LEGO part, so I do a multi-stage sort. First I sort into broad categories, which is what you see here, and then I take each category and do a secondary sort, and in some cases even tertiary, to their final categories. How do you sort LEGO?